Vive la differenza!–Vive la difference! Our olive farmer friend, Keith, just asked when we’re moving to Italy! He is in high spirits. The harvest is over (1000 trees!) and while he was initially pessimistic, it ended up a bumper year. Well, as much as I love Italy and Italians, I’m reminded that moving house along with divorce and death are the three most stressful life events. However, we did our best to transport Italy to France! will keep me busy for weeks and ease our passage back to rural France. A soupçon of green gold (2012 vintage)–freshly made in Tuscany. What a haul, Robin and Meredith! Can’t wait to see what you cook up when you get home! 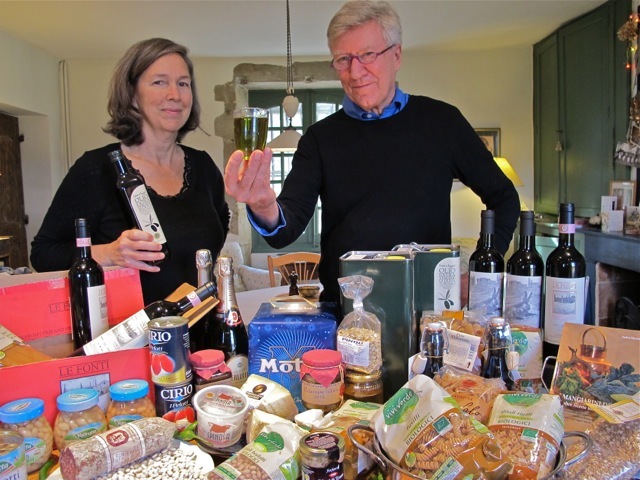 Meredith Robin welcome home you have certainly brought the taste of Italy back with you. Oh, Robin! You, Meredith, Beau and and his you buddy make my Day! Are you planning an Italian Christmas? Have you ever read/met Adriana Trigiani?? amazing author and cook! Makes me want to trade in my eastern European heritage and become Italian! She loves NYC, too! Thanks Katie!–I’ll check out Adriana. What’s your understanding of an Italian Christmas? Plentiful harvest, all around. Looks yummy! What a wonderful haul, makes me wish I had more time to cook. Havent checked in for a while Robin, but just thought I’d let you know I have now been a non-smoker for 3 months now and counting – wahoo!!! Hooray Jackie–it’ll be worth the effort. signed former smoker! Good for you it can be a struggle but well worth it in the future. Robin and Meredith, welcome back to France. The haul looks amazing. I am glad you have beans that are not jarred or canned. I use dried cannelini beans in my cooking–takes a little bit of time, but so much more nutritious and delicious than the other kind. Thanks for your friends spiral pasta/zucchini recipe, too. I’m not a vegetarian, but that is a delicious choice for any guests! Our friend Helen handed me a bag of specially good dried beans (she said) as we left–half a pound are soaking patiently on the counter. Happy to hear that, Roz–thanks. My husband is Italian and we love Italy, France etc, but I agree with you Moving is the pits, however I am in the process and I dread it. But we must downsize Basil can’t do the steps.I keep telling myself I am happy, I am happy maybe it will help. Might be an encouragement to go–thanks Fiona. May you have a fabby Christmas and we get to see all the goodies you cook up. Can’t wait to see what you cook up with the goodies! 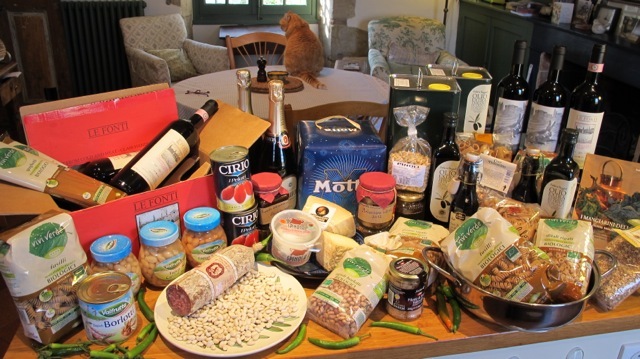 Love the cat on the table in the background….so it’s not just my cats that are table hoppers? When I was reading those lines and saw the full table I had to smile. I can understand you very well. I know the same phenomenon from my visits to Italy. Also, we always have a full trunk. Vinotheque Munzert here in Munich is waiting for the new shipment of Boggioli olive oil 2012. Looking forward if I can taste the olive oil. The new oil is delicious Martina–hope you like it! SWAG! lol What a Haul of Goodies! You guys are Looking Fit and healthy too…Wellcome Back! Looking forward to ” Mucho” new recipes!…Regards Maurice in Glasgow. I reckon Pippa is showing her disgust at being ‘abandoned’ by her people for 2 weeks – “You left me so now I am going to ignore you – at least until I want feeding, that is”. I have been reading your Blog for sometime now but this is the first post I have made. I have in front of me at my computer some photos taken in 1997 at the Poldark Society lunch in London. One with you, another with Kevin McNally and another with Angharad. I was on a trip around the UK and was able to stay an extra week so I could attend the lunch. What great memories! Hello Helen–and thanks for sharing that memory. I went to all the lunches bar one I think. Lovely people. It looks just like Christmas! I have not an ounce of Italian blood in me, but it is my very favourite food. I am a snob and shop for only the finest Italian ingredients. You and Meredith seem quite prepared for the winter.